This is a copy of an original tintype of Pvt. Silas Coster, Co. B, 2nd Wisc. Vol. Inf. which was obtained by Company B from a second generation family member. Mrs. Pearl Coster and a member of Company B met while both were doing research on the Series 1200 Collection in Murphy Library at the University of Wisconsin - LaCrosse. The late Roy Silas Coster was the great grand nephew of Silas Coster. Pearl Coster, wife of Roy, graciously allowed Company B to make a copy of the tintype. Silas Coster was born Sake Kooistra in Friesland, Holland, Feb 8, 1841. He and his family left Friesland on Feb. 26, 1853 and survived a shipwreck in the Bahamas during which he lost his father and two siblings. 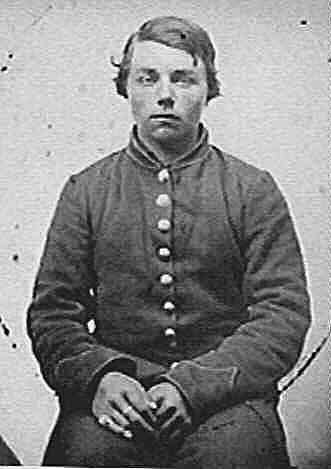 Silas, his mother and brother entered the United States at New Orleans and finally arrived by steamboat at Prairie LaCrosse on July 5, 1853. The family settled in New Amsterdam, Town of Campbell, LaCrosse County. Silas was enlisted by Lieut. Woodhouse in LaCrosse on March 10, 1862 for 3 years, as part of the 1862 recruiting effort to rebuild the 2nd Wisc. His service time and presence on the muster roll place Silas with Company B at Catlett’s Station, Gainesville, Groveton, Second Bull Run, South Mountain, Antietam, Fitzhugh’s Crossing, Chancellorsville and Gettysburg. Silas Coster was wounded in the right thigh at Gettysburg on July 1, 1863 and died on July 30, 1863 because of that wound, his leg having been amputated. He is buried in the Wisconsin section of the Gettysburg National Wisconsin Section C: 7th reg. The information and research for this article was provided by Pearl Coster with assistance by Robert Taunt. Gilbert Motier Woodward was an member of the LaCrosse Light Guard, initially as a Corporal when it became Co. B of the Second Wisconsin and was publicly commended by Brig. Gen. Meredith for gallant behavior during the engagement at Gettysburg. He was born in Washington D.C. in 1835 and in 1850 apprenticed in the printer's trade in Baltimore, Md. He worked as a printer and proof reader in that city and Washington, D.C. for the National Intelligencer until February, 1860 when came to La Crosse and studied law with the firm of Messmore & McKenney. He was admitted to the bar at Black River Falls but did not immediately enter into his profession as the war was beginning. He became an Orderly Sergeant in Sept., 1861,; Second Lieutenant in August, 1862; First Lieutenant , September, 1862; and Adjutant of his regiment in June, 1863. He was acting Aide-de-Camp of the 1st Brigade, First Division, First Army Corps (Gen. James S. Wadsworth's Division) at the battle of Gettysburg. In this engagement he received a severe gunshot wound in the right forearm. His services as Aide-de-Camp were continued during the Wilderness Campaign, May 5 to June 11, 1864, his division then being part of the Fifth Corps. He mustered out of service at Madison, June 30, 1864 and returned to LaCrosse. A leading lawyer in LaCrosse and one of it's best known citizens he was a member of Congress in 1882, mayor in 1874 and District Attorney in 1865, 1867, 1869, 1871 and 1876. He was active in Democratic politics and attended the national conventions as a delegate several times.